Can you imagine how easy serging could be if you didn’t have to thread the machine? Look no further than the Imagine – Baby Lock’s most popular serger. This advanced home serger includes Jet-Air Threading, which threads the lower loopers with the touch of a lever, and Automatic Thread Delivery to thread in any order. Exclusive Baby Lock Jet -Air Threading – Threading a serger has never been easier than with the revolutionary Jet-Air Threading from Baby Lock. With just one touch of a lever, thread is sent through the tubular loopers. There are no thread guides, no struggling, and there’s plenty of extra time to serge away! 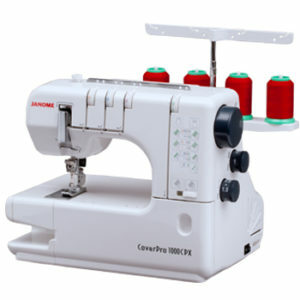 Automatic Thread Delivery System – Set the Imagine to the type of stitch you want and serge. The Imagine will deliver a balanced stitch on any fabric with any type of thread. It even goes from one fabric type to another without skipping. Tubular Loopers – Imagine no exposed thread and no thread guides. Baby Lock has made that wish come true with tubular loopers that can be threaded in any order. This eliminates threading mistakes and protects the thread, giving you more freedom to serge than ever before! Looper Drive System – This exclusive Looper Drive System prevents loopers from becoming misaligned or out of time, reducing the possibility of major looper damage. This protects your machine from needing repairs, allowing you to serge worry free! Advanced Knife Driving & One-Way Clutch System – Baby Lock created a knife system with a larger cutting bite that allows thicker fabrics to be cut with ease and increased visibility.